I was among [the] folks who were at Headwaters on Saturday night for an evening with Chris Chandler, Paul Benoit and Ashland's own Frankie Hernandez together in concert. Although Chris Chandler was on my radar, I had never seen him live and I didn't really know what to expect. I checked out his website and he calls what he does "a modern day minstrel show" and when I first heard that, I thought to myself, what is THAT? What they do isn't at all defined by the word concert since it is so much more. Since their show really doesn't fit neatly into any sort of a description box, let me tell you in just a few hundred words why I think you'll want to go see them when they come through Ashland next time. 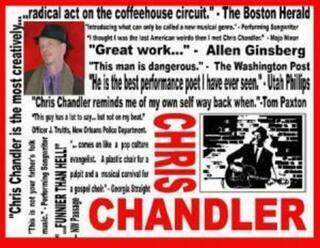 Chris Chandler is a Carney barker for free thought. (Step right up ladies and gentlemen, boys and girls of all ages and learn how to pay attention to mass consumption.) He has this incredible gift of seamlessly linking stories, songs and poetry together while on the screen behind him you'll view these striking old film clips. As he is talking, his passion, ideas and so many powerful words are performed and he takes you along with him on this discovery, right to the edge of brand new thought and then this really magical thing happens when he pulls back and you hear Paul's rich, clear, gentle voice and music that brings you right back from the edge of wherever it was that Chris was taking you as Paul begins to sing. Listening to Paul Benoit's voice is pure joy and as I was listening I kept thinking about Eric Clapton. His voice is that honest. Frankie Hernandez played a couple of songs on his own and then merged into playing with this unique duo. Listening to all three of them perform together was wonderful. If you get a chance to hear any of these three in concert, go! You'll come away from the evening feeling energized and hopeful. I was totally won over by the creative team of Chandler/Benoit and look forward to seeing and hearing them again in July.